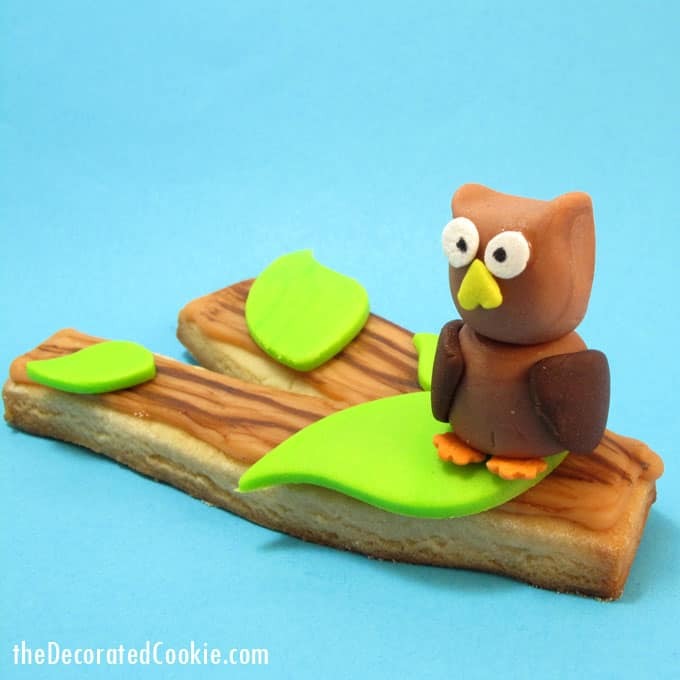 Decorate tree branch cookies painted with a wood grain, and perch a fondant owl on top. 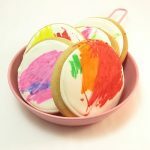 One useful cookie decorating technique is painting on cookies. 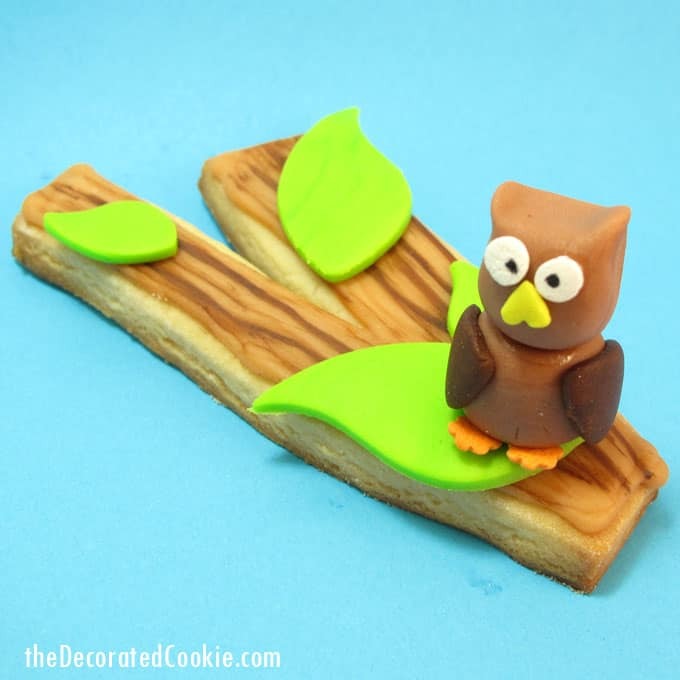 Here, I use the cookie painting method to create a wood grain pattern on tree branch cookies. And because what goes well with tree limbs? Why, a little fondant owl perched on a wood-grained tree limb. Forgive the bum eye on this guy. I had slim pickings for white sprinkles left in my collection. 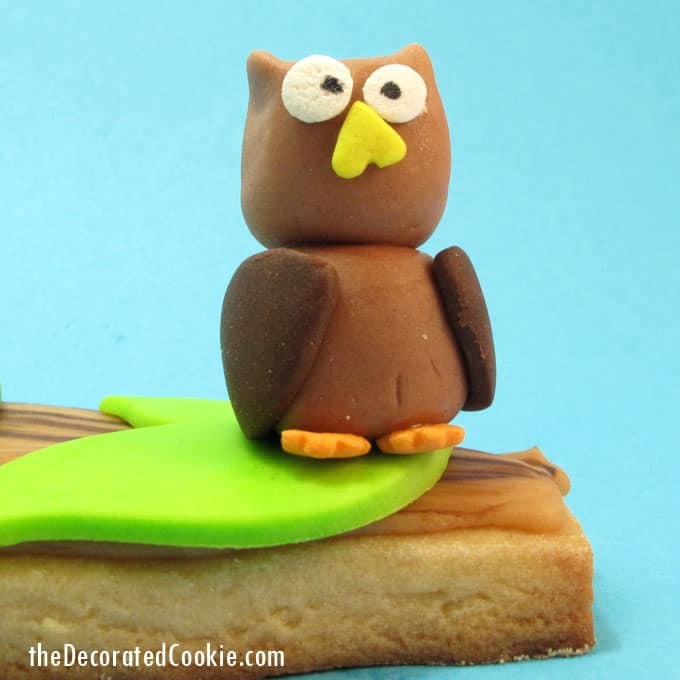 So, here is your fondant owl with tree branch cookies. *For food coloring, I use Americolor soft gel pastes (Chocolate Brown and Electric Green). 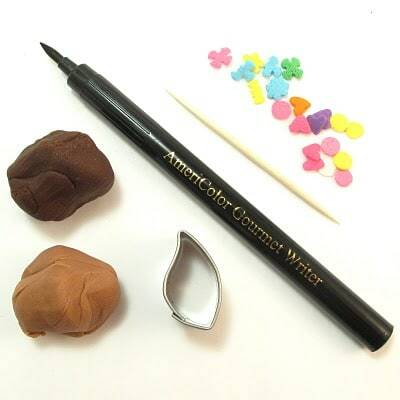 I use a black Americolor Gourmet Writer for the pen. Find cutters, bags, couplers, tips, fondant and paint brushes in the craft store. 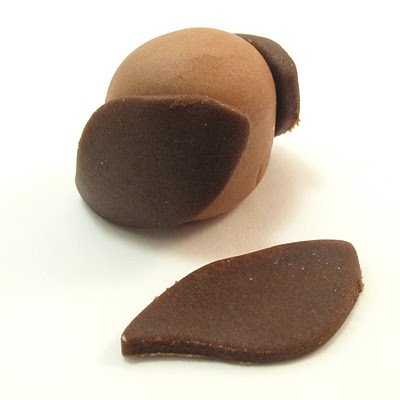 The leaf fondant cutters will likely come in a set and can be found in the craft store, along with the sprinkles. 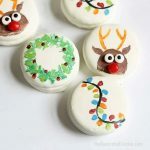 Click here for tips on finding cookie decorating supplies, click here. For basic cookie decorating instructions, click here. Roll out chilled dough according to recipe. With a knife or a dough scraper, cut out stick shapes (mine were like “V”s, but you can just do rectangles, too). Bake and let cool. Prepare frosting. Tint some (I use about a cup, depending on how many cookies you make) light brown with the Chocolate Brown coloring. 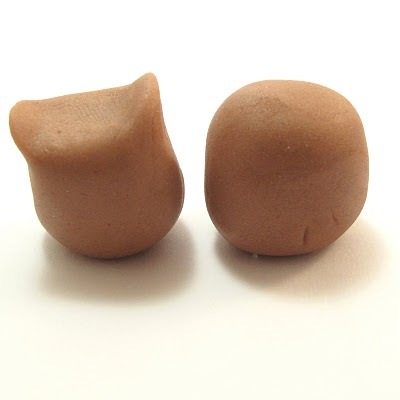 Prepare a frosting bag with a coupler and size 4 decorating tip and fill with about half of your brown frosting. Tie closed with a rubber band. Pipe an outline on the sticks and let set about 15 minutes. Thin reserved frosting with water, a few drops at a time, until the consistency of thick glue. 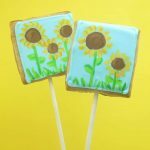 With a squeeze bottle or small spoon, pour the thinned frosting in the center of the stick and let flood to the edges, encouraging as needed with the back of the spoon. Let set well, several hours or overnight. I won’t even attempt to give a tutorial for this or claim an iota of credit, because the original is so lovely. Dab a small (liner-size) paint brush in a drop of brown food coloring. If the food coloring is thick, you may add a drop or two of water to the coloring. Paint lines for the wood grain on top of the dried light brown royal icing. For each owl, roll two balls of light brown fondant, about an inch or so in diameter (one may be slightly bigger). For the head, pinch two ears with your fingers. For the body, just flatten the top and bottom slightly. For the wings, roll out the darker brown fondant and cut out leaf shapes with the small leaf cutter and attach to side of body with dabs of light corn syrup. To assemble the rest (use a toothpick to dab light corn syrup on the parts to adhere), attach head to top of body, attach two small round white or yellow confetti sprinkles to the head for eyes, attach a yellow heart sprinkle for the beak, and two orange flower sprinkles for the feet. Draw two black dots on the eyes. 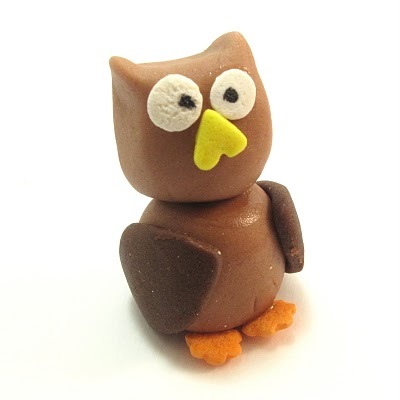 Using corn syrup as glue, attach leaves and owl to sticks as desired. I LOVE owls, that is too cute Meaghan!! Oh my GOSH! I LOVE, love, LOVE that you made this!!! Sweet little owl! And your branch is so perfect! Squee! Meaghan…I'm so glad you "know" you! And, I don't know if you're a Harry Potter person, but wouldn't these be CUTE for a HP party and white owls like Hedwig? Oh, WHEN does that movie come out?!?! Bridget tweeted this post. So happy I clicked on the link. This has got to be one of the cutest cookie ideas I've seen. Thank you for posting. Oh my sweetness! This is seriously cute ~ you are so creative! WOOWWW! this is so so cute, i love it! you have such excellent ideas. Your owls are darling! Love how they make your cookies 3D. Always appreciate your tutorials too! 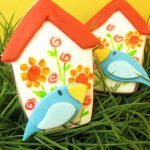 Your cookies are amazing….sooo much talent! These cookies are my cookie soul mate. OMG – those are SO cute! youre so talented! love these. Meaghan, I am SO happy you sent me the link to this post. Don't know how I missed it before but it would have been a shame for me not to see it. This idea of the owl on the branch is brilliant! BRILLIANT I tell you. LOVE the 3D effect of the owl on top! Talk about whimsical and clever! I'm very pleased that my simple wood grain technique could inspire such greatness 🙂 I am humbled!! !